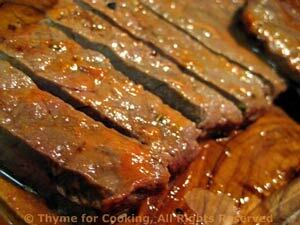 Easy Dinner from Thyme for Cooking: Grilled Flank Steak. 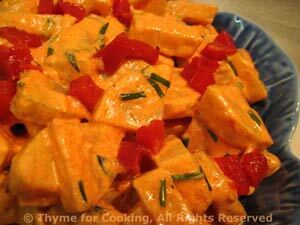 Potato salad made with leftover Pimiento Dressing makes an easy dinner. 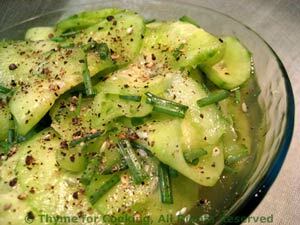 The cucumber salad needs a little advance work but can be done anytime during the day. I peel the cucumber because it's easier to slice - you don't need to. A simple marinade for a simple cut but it imparts lots of complex flavors. To make the most of a flank steak, cook it quickly to medium-rare, than slice it thinly across the grain at an angle ...think of it as a square and slice diagonally from corner to opposite corner. Mix all ingredients except flank steak and pour over flank steak coating both sides well. Marinate 15 - 45 minutes (or longer in the fridge). Cook over high heat 3 - 5 minutes per side or broil 5 - 6 minutes a side - or until done as liked. Slice thinly at an angle on the diagonal for the most tender slices. Serve. This is my mother's recipe, as made by her mother.... Probably German in origin. Peel cucumber and thinly slice, using a box slicer, food processor or mandolin. Put 1/3 of the cukes in a deep bowl, sprinkle 1/3 salt. Place a small plate or bowl, that will rest directly on the cucumbers, on top. Add a weight of some sort to add pressure to the cukes, and let sit for an hour. Drain, rinse lightly and squeeze dry. Serve. This gets better the next day.